Suit up your crew in turnout gear, PPE and flotation devices, using rope rescue equipment for these three ice rescue training drills Note: This article originally appeared November 20, 2017 on FireRescue1.com and is used with permission. Disclaimer: I am not an experienced ice rescue technician. But I’m guessing that neither are many of you who are reading this article. I’m also guessing that many of you live in areas of the U.S. and Canada where it won’t be too long before ponds and lakes start freezing over. And it won’t be too long after that that people will start heading for those frozen bodies of water to pursue winter recreational activities like skating, ice hockey, ice fishing and the like. If I’m speaking of the sort of area where you live, and you’re a firefighter or EMS provider, you also realize that being presented with a person who has fallen through the ice and needs rescue is not a question of if, but rather when. 3. May or may not have access to experienced ice rescue personnel. Ice rescue brings a set of equipment demands that turnout gear (and most of the equipment currently carried aboard your fire apparatus) cannot meet. A good place to get started is to obtain the basic equipment your department really needs to have. To avoid becoming victims themselves, firefighters need the proper protective equipment when conducting cold-water or ice rescues. The right PPEwill guard against hypothermia and keep rescuers afloat. These exercises are designed to take place on dry land with the tools, equipment and PPE that you probably already have on your fire apparatus. And that’s OK, because what’s of the utmost importance is developing and practicing a rescue process. The basic process can only improve as your department is able to add equipment and PPE specifically designed for ice rescue. 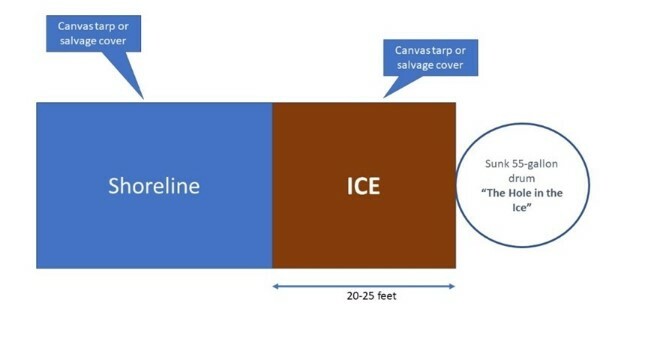 Spread a salvage cover or canvas tarp to cover the ground between your hole in the ice and the “shoreline” from which participants will be working. Check out this outstanding articleabout ice rescue from my FireRescue1 colleague, Dalan Zartman. Dalan is a technical-rescue curriculum subject-matter expert for the Ohio Emergency Management Agency and Department of Homeland Security. He has taught more than 100 technical-rescue courses at Bowling Green State University, where he serves as regional training program director and advisory board member. Command No. 1: "Stick your hands and arms out on to the ice." In a real scenario, if it is cold enough, their wet arms will freeze to the ice, which may hold them if the rescue is prolonged and they can't stay above the surface on their own. Command No. 2: "Pull with your arms and kick with your feet." The sooner the victim can get their waist to come up in the water and pull with their arms, the better. The goal is to get their chest – and the majority of their bodyweight – over the ice’s edge. Command No. 3: "Now roll on your side toward me." This will equalize the victim's load on the ice edge as much as possible and allow them to escape without point loading the ice and making a new hole or simply expanding the existing hole. During this phase of the training exercise, have each participant practice giving each of those commands to the “victim.” Have the victim respond positively to the rescuer’s commands. And don’t tolerate victims who mess with the rescuer by not following commands. The purpose of this training is to upload the right behaviors and outcomes to the participants. The next time it might be for real. During the self-rescue coaching, rescuers should closely evaluate the victim's ability to comprehend and comply to coaching commands according to Zartman. If victim’s mental or physical capabilities are diminished, hypothermia has likely set in and they will continue to decline rapidly. This must prompt rescuers to immediately progress towards a more active rescue mode of operations. For this training exercise, use the same scene setup used in the Victim Self-Rescue exercise. If the victim is compliant and coherent, but simply can't get out of the hole, progress to reaching or throwing. When throwing or reaching, alert the victim to what you are about to do and then do it. This is usually a short window of opportunity. Using the 35-foot extension ladder, mark a line far enough away from your hole in the ice (indicating the shoreline), but close enough that the 35-foot extension ladder can be used to reach the victim. Have teams of rescuers push the ladder across the “ice” out to the victim. Then have a rescuer in full structural PPE, wearing a personal floatation device, with a lifeline rope attached to them crawl out on the ladder to assist the victim in getting out of the hole and on to the ladder. Using rope-rescue throw bags, mark your “shoreline” so that the hole in the ice is within reach of the rope in the throw bags. All personnel who approach the water's edge should have an approved PFD on and be wearing their turnout gear. Have participants in teams of two practice the proper technique for throwing the bag over the victim’s head so that the rope falls on the victim. Have a third member of the team providing verbal coaching to the victim so that they grab the rope. Have the rescuers pull the victim to safety. • Did we operate safely? • Did we operate efficiently? Look at the process you developed. Did the exercise go according to the training plan? If no, what adjustments should be made before the next exercise? Find solutions, not fault. • Did we operate effectively? Did we accomplish the objectives for the training exercise? Did the students acquire new knowledge and skills? Did they refine previously learned knowledge and skills? 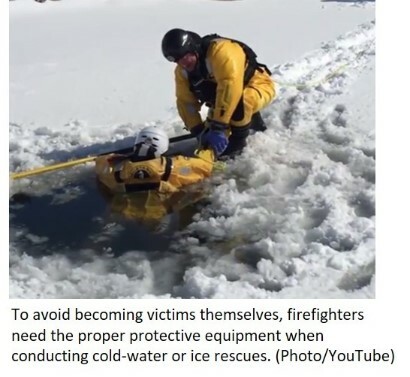 • Demonstrate the safe, effective and efficient use of equipment available from their fire apparatus for both reaching and throwing ice rescue techniques. I strongly encourage you and members of your department to take in FireRescue1’s Ice Rescue videos. Together with Daylan's article, these videos can give your department’s personnel a good baseline for the knowledge, skills and abilities necessary to conduct an ice rescue safely, effectively and efficiently. Will conducting these training exercises make your personnel ice rescue experts? The short answer is no. The long answer is that they’ll be better prepared for an ice rescue than if they hadn’t, fair enough?